Over the last couple of weeks we have run a series of flight reviews from Jamie’s recent month-long holiday in Asia. The majority of the international flights were booked with Avios. Before we go on, I should say that I wasn’t involved in the booking of this trip and didn’t know he was going until I got an email offering me the reviews. You’ll see why I said that in a minute! In theory, this itinerary should have cost him 255,000 Avios. In reality, Jamie only paid 200,000 Avios. 99% of British Airways Avios collectors do not know that BA also has a second redemption chart. You can see the original by clicking here to ba.com and scrolling down to click on ‘Partner Airlines’ and then ‘Avios costs for booking on two or more oneworld airlines’. This is the reward chart that British Airways uses to price redemptions which include two or more oneworld partner airlines, excluding British Airways (although BA can be included on an itinerary). The chart is for economy travel. Multiply by two for business class and by three for first class. Because Jamie’s itinerary used two oneworld airlines, plus British Airways, he could use the multi-partner Avios redemption chart to price his trip. This is a total of 15,409 miles. You can get exact distance figures from gcmap.com – click on ‘Distance’ and use airport codes, eg ‘LHR-KUL’. 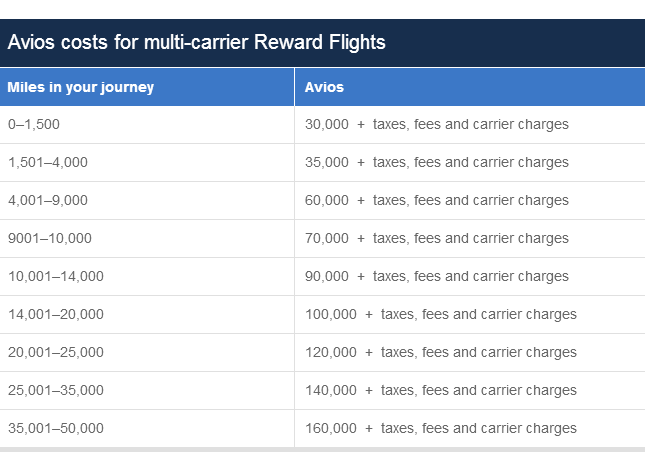 Look at the multi-carrier Avios reward chart. 15,409 miles falls into the 100,000 Avios band (14,000 – 20,000 miles flown) for Economy. We double that for Business Class. This is why Jamie only paid 200,000 Avios for his trip, and not the 255,000 Avios that it would otherwise have cost if he had booked it one flight at a time. He made a BIG mistake! Look again at the reward chart. Jamie’s trip was 15,409 miles. He paid 200,000 Avios, which was the cost for trips of between 14,001 and 20,000 miles. This means he could have added an additional trip of up to 4,591 miles for FREE! ….. or many other options – for no additional Avios! So …. well done to Jamie for remembering to ring BA and book his itinerary via the multi-carrier redemption chart, which saved him 55,000 Avios. But a slap on the wrist for missing out on the chance to add a couple of future trips onto his itinerary for no extra Avios …..
My Avios posted in my BA account for the first time in November, but 1,400 extra points arrived in my defunct Avios account today labelled ‘Lloyds Bank Manual Adjustment Award’. Anyone else have these? My monthly accruals have been correct and I don’t have any outstanding complaints with Lloyds, so this is a nice bonus. Obviously I transferred them out straight away. Worth a check…. I’m showing a surprise stash as well., but no idea why. Only 94 on my husband’ s under that heading but not complaining! 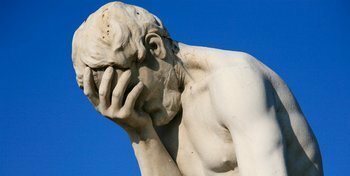 From my experience – taxes are a mystery, booking is painful, agents are not knowledgeable. You can include one overland sector (which can be between different continents); some people have reported squeezing in two overland sectors. If you’re booking J all the way but one sector is only available in Y, you can still add it (it won’t affect the total price which will be charged at J rates), and then upgrade to J if availability appears (no surcharge in miles, but need to pay difference in taxes). This was for business class and I managed to squeeze it into the 20000 mile bracket (I think my distance in total was around 19900, so literally made my money’s worth). This ended up costing 200,000. Now to get this rock bottom taxes you MUST avoid ex-UK. After hours of painful searching, I found that ex-DUB and ex-WAW had the lowest of taxes ex-EU (as well as slightly more Eastern destinations such as OTP, SOF, PRG). However I couldn’t choose DUB as it was just crossing the 20000 bracket and I wanted a wide body QR flight, hence ended up choosing WAW. Secondly I would’ve chosen straight back to LHR from DOH, however there just wasn’t any J availability on the dates I wanted to go, hence slightly more stops. Also, I had to start from PER instead of any other Australian airport so I could sneak it into the 20,000 miles. Finally I was very picky about trying to maximise QR in my itinerary as frankly they’re the best J class, but in order to meet the 2 OW carriers rules, I added a PER-SIN with QF. The final CPH-LHR sector is BA, naturally. All of this totalled £459.70 taxes. Had this been ex-LHR it would’ve been £750+ from what I remember! Happy to answer more questions! But I’m chuffed with this true bargain value you can achieve with this chart! So just to add, my return sector, though it has 3 stops, the longest transit is 3 hours in SIN which isn’t bad considering you’ve got the lovely QF and CX lounges (and BA if you’re one of those that solidly sticks by the airline lol! 😛 ). 1 hour in DOH sand 45 minutes in CPH. In theory, if availability permitted I couldn’t done PER-SIN-LHR or PER-HKG-LHR or PER-KUL-LHR or even PER-SIN-DOH-LHR/MAN/EDI and cut a couple of stops. But sadly, very scarce J availability on my dates. The taxes wouldn’t have changed much and would’ve stayed around the same on the return sector. It’s the ex-EU sector that has the most damaging taxes and that’s where one has to be smart in choosing where they depart from. Just to add, I got my positioning LHR-WAW flight in CE for £160 (one-way), (was only £70 for Economy), and the SYD-PER positioning flight with QF for £120 (economy). So all in all, I paid £739 for all my flights and 200,000 Avios and at least I’m gaining a couple of thousand for my 2 positioning flights. Nice and if you can start from LGW-VIE one way various dates with level = £26, then, VIE-WAR £21. Nik – I hope you paid on Plat or have other travel insurance! 2.5 hrs connection time for a positioning flight—>WAW, starting on your big itinerary??? Not sour grapes or anything seeing your great trip lined up, honest lol – but I’m the cautious type so would have allowed a bit more time. But yes I do have Amex platinum insurance and also, the other alternative BA flight to WAW had like 8 hours transit or something, so ended up with this! But yes, fingers crossed lol. @NIk “In theory, if availability permitted I couldn’t done PER-SIN-LHR or PER-HKG-LHR or PER-KUL-LHR or even PER-SIN-DOH-LHR/MAN/EDI and cut a couple of stops.” Don’t forget QR fly to CWL now, always great availability! So if you are booking through BA do you have to use BA for one of the legs? I’m not a seasoned pro with Avios, but have managed to learn a lot thanks to websites like this and others. I’m a bit confused here. I presume you’re doing the ARN-DOH-PER as a commercial revenue ticket in order to maintain your gold? Oh yes, obviously no TPs are due if using Avios to pay for the booking. I don’t need a whole bunch of TPs (cut-off is early July) – I just want to experience Qatar (I actually work for BA) and have a week or so in Perth. Sorry it’s so complicated, Nik! Happy to use multi oneworld carriers if not too complicated/arduous! Coincidence my partner works for BA too lol! I’m on a night shift, hence why I’m up. Lol. So, you earn 0 Avios and 0 TPs on any Avios/reward booking. So if your purpose is to maintain Gold, this isn’t the way naturally. However, for the number of points you have, you wouldn’t be able to do this journey, as using only 120,000 Avios this way would only get you a total distance of under 9,000. Secondly it’s pertinent that you have 2 or more Oneworld carriers (excluding BA, you can have BA on top of the 2, but it can’t form the minimum 2 if that makes sense). Actually I realise this comment is getting longer and longer haha. Hope I’m not violating terms by posting email here lol. Just a comment to say I find these experience reports the best thing about HfP, much more useful than the general industry news which dominates other points sites. Keep it up! IIUC, I can book a number of flights on a minimum of two oneworld carriers and pay the mileage rate from the table, rather than the standard avios cost per flight? As I am looking to fly to South America on a 2-4-1 my options would be to do the whole trip on the redemption table, including internal flights, or use the 2-4-1 to get us there and back and use the redemption table for internal flights, assuming there are at least 2 oneworld operators in south america? that ‘two or more oneworld® airlines’ are required to utilise the multi-partner chart, so a BA or Iberia ex-EU and one LAN/LATAM when there will see you right. Also, I found the oneworld interactive map very handy for prospective route planning (http://onw.innosked.com/(S(tabmfzvxv1g2sgyhun4hc25w))/default.aspx?show=MAP) and the Qantas website to be better than BA for oneworld reward availability searches. Using the chart that’s 140,000. I’m either being incredibly stupid, which i suspect is the case, or the chart just wouldn’t be beneficial to this itinerary? Correct. Your routing isn’t nearly complicated enough to justify it! However if DOH-COK is not on Qatar and you want it all on one ticket, to protect you in case of misconnect, then you’re stuffed as it will price off the two-partner chart anyway.